Looking for an easy side dish? This is it. It's simple, tasty and the cheese takes this rice into the comfort food category. Hubby and I had cheesy zucchini rice alongside grilled mahi mahi with mango avocado salsa on Friday night. Whenever I serve a new dish, I anxiously await the verdict from my somewhat picky particular husband. Apparently I'm not the only one. Have you seen the Pioneer Woman's new show on Food Network yet? Hubby and I watched the third episode on Saturday morning and she shared some of the things her husband won't go near. Like goat cheese and sauces containing wine. I had to laugh when I heard this. Especially with Hubby sitting right next to me. He can't stand goat cheese and has a number of other particular food preferences. (Though, I must give him credit, he does like wine based sauces.) The Pioneer Woman decided to do a blind taste test with her husband and had him try her penne alla vodka. She didn't tell him it had vodka in it (just in case he carried over his aversion to wine in sauce to other alcohols). He ate it and....drum roll please.....he liked it! And that's what happened with my Hubby and the cheesy zucchini rice. Though I didn't keep any of the ingredients a secret. Hubs generally isn't big on cheese, but enjoyed it in this dish. He even went so far as to say he would like me to make it again...the true sign of a successful dish in our house. I don't have kids, but would imagine if my picky particular Hubby likes this, so would my nieces and nephews. 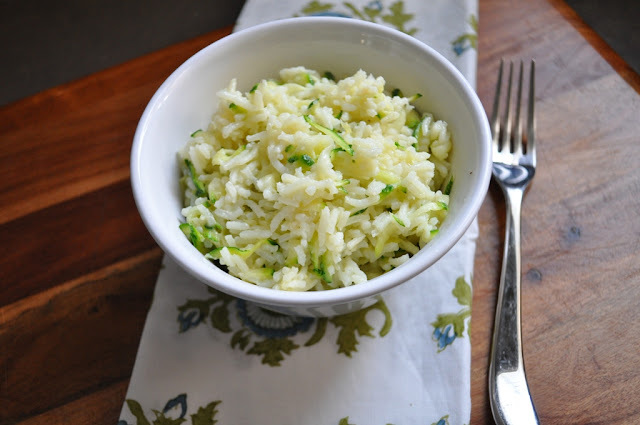 Zucchini has a very mild flavor and brings a nice texture to the rice. You get to sneak in some veggies but still lure them in with the cheesy rice. Good stuff for kids and adults alike! Thoroughly rinse rice under cold water to remove excess starch. Measure out chicken broth and butter. In a medium saucepan bring rice, chicken broth and 1 tablespoon of butter to a rolling boil. I also added in a 1/4 teaspoon of salt. Turn heat to low and cover rice tightly and cook for about 20-25 minutes until the chicken broth is fully absorbed. While rice is cooking grate your cheese and zucchini. Once rice is cooked, remove from heat and add grated zucchini and remaining tablespoon of butter on top of the cooked rice, re-cover and let stand for 5 minutes. The steam from the rice will cook the fine slivers of zucchini. 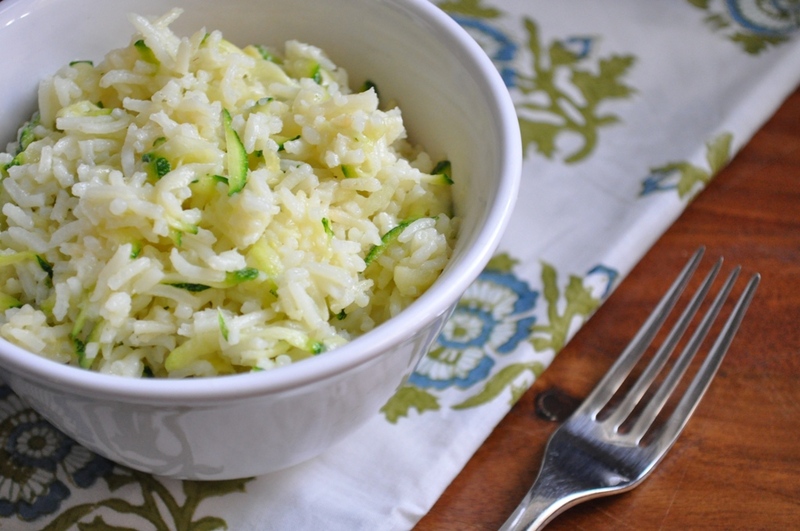 Transfer rice to a serving bowl and stir to mix in zucchini. Add cheese and salt and pepper to taste and stir until well combined. Serve immediately. PS - saw you won a ticket to a food photography workshop from Foodgawker? How awesome is that?!? This looks really tasty, thanks for sharing! It's funny, I use the same litmus test for new dishes in my kitchen, too. If my husband says "yes" to "Would you eat this again? ", I know we have a winner! This looks like a great side dish! I haven't caught the PW show yet, it sounds good. I sometimes don't tell my husband something is healthy until after he says he likes it. @Tracey & Margot - I'm not above tricking my Hubby into eating something. At least sometimes I try...I act all cool, but then he'll ask, "what's in this?" or "how did you make this?" Usually I get busted at that point and just hope he likes it.